Happy Monday!!! 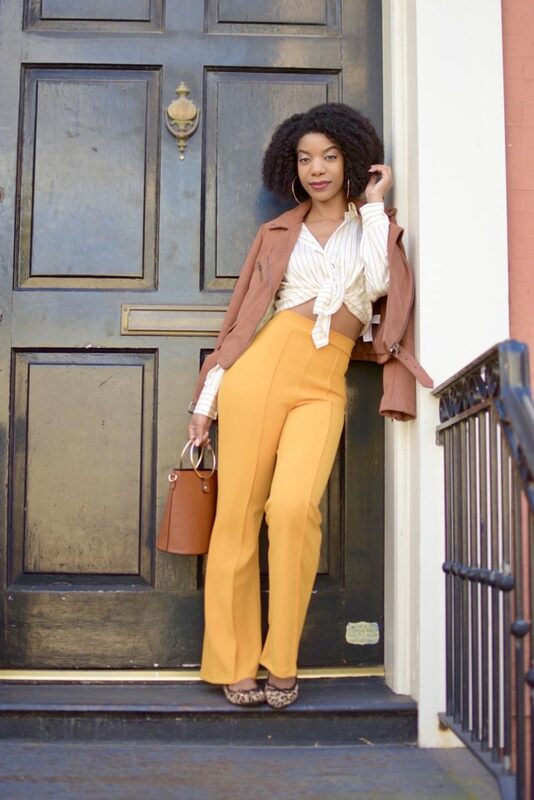 Today on the blog I’m showcasing these super cute pants from SheIn, in one of fall’s hottest colors, mustard yellow! Notice the two different hair styles in these pictures? On this shoot day, I did my normal go to twist out style, used my usual product and method for stretching it out, and gave my hair plenty of time to dry before untwisting. When I actually untwisted it about an hour and a half before my shoot, I was so disappointed because it came out a frizzy, undefined mess. I was also frustrated because I’ve been doing twist outs for years at this point, so it shouldn’t have turned out bad, plus, I had a photoshoot soon! I decided to just roll with it, and see how the pics were looking on my photographer’s camera to see if I should make any adjustments. It started off looking aight in pictures, but it was surprisingly cold and windy, and the wind wasn’t complimentary to my hair that day, let me tell you, lol. So I put a little bit up into a mini ninja bun, and then decided to bun it all up for the next two outfits that I shot. Thanks to my photographer, I got some great shots, but my confidence definitely wasn’t quite there, because ladies, you know how it is when you don’t like how your hair looks! Thanks for reading! 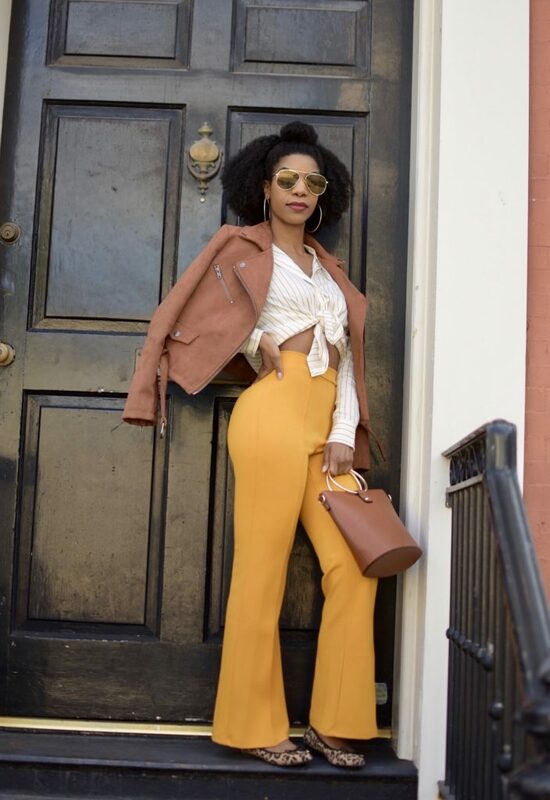 Are you rocking mustard yellow this fall/winter? Let me know below! Your hair is goals!! Love the pants they are super cute! I love these pants. 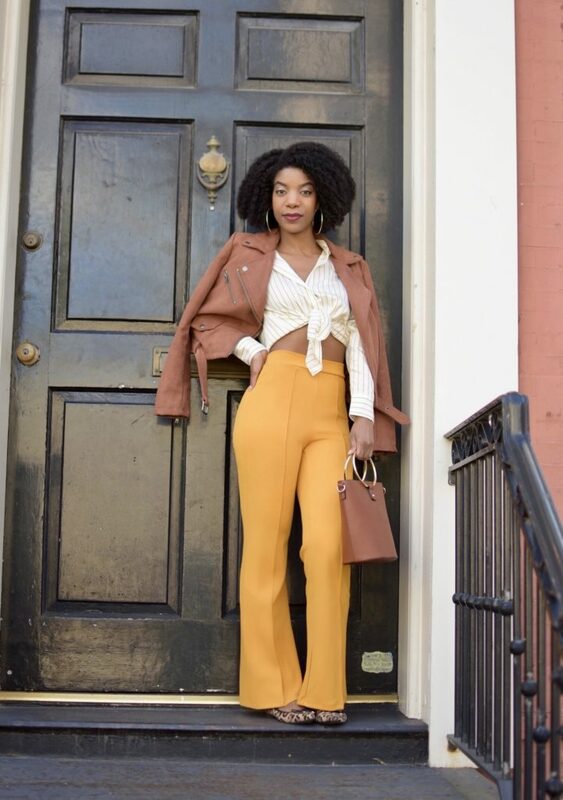 Yellow is definitely the color of the season. As for your hair, i looks better than you think, the ninja bun was genius! Also I love the color of your moto jacket! I am super in love with those pants and the jacket! Yellow is an amazing color for the season! 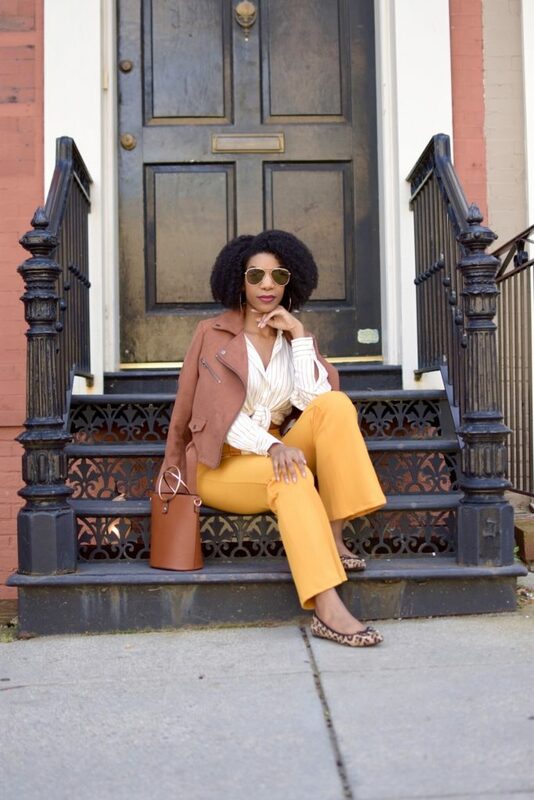 Love the combination, especially the yellow pants! They’re the perfect color for the Fall! As much as I love the jacket and pants, I love your hair even more. So fun and versatile. I almost bought a pair of pants like that from TJ Maxx. Those are hot! Now, I regret not getting them. THat yellow looks great on you. 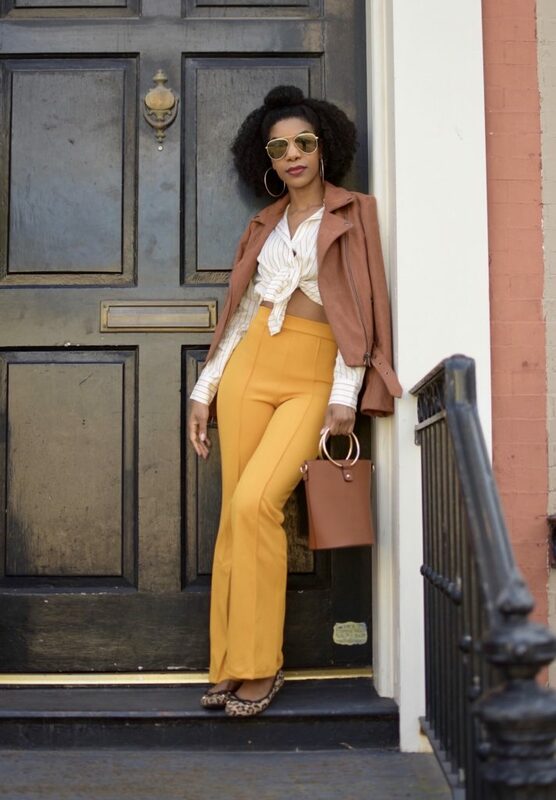 I love the whole 70’s fab vibe you have going with this look. The jacket is really cute, I would totally rock it myself if it was in another color. I have to be careful wearing brown because it can wash me out and look too matchy with my complexion. Love! Love! Love this look! 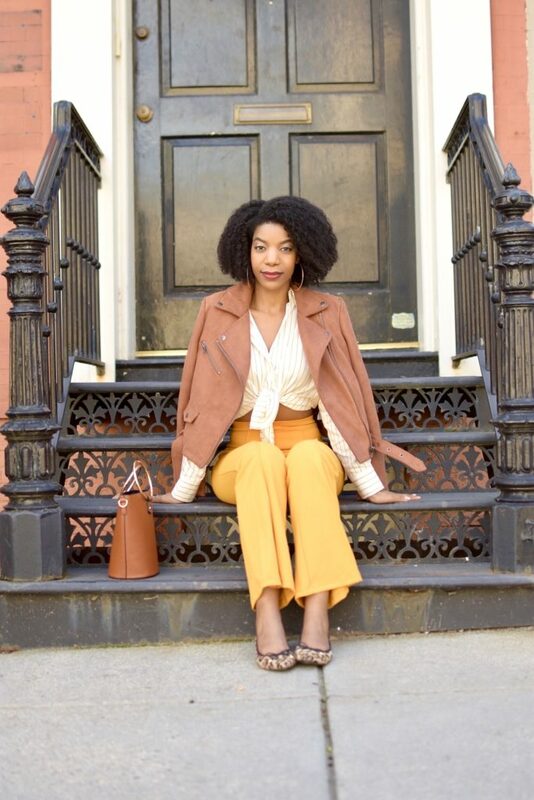 I especially love the yellow pants! 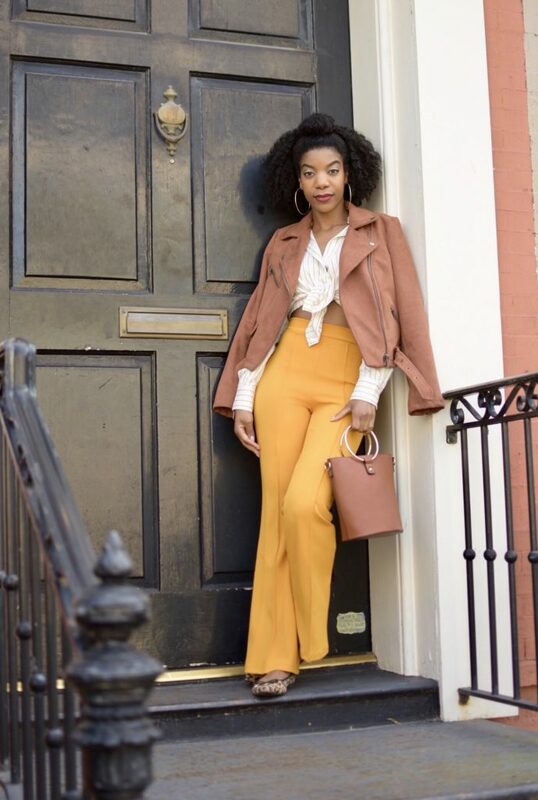 This look is perfect for fall.